Personally, 9/11 was a gut-wrenching emotional experience for me. I was driving in Connecticut on my way to visit a store that morning when a peer called to tell me about what had happened. The second plane had just hit, you see. I spent that morning in South Windsor, Connecticut with my team watching as the day unfolded. I remember, that morning, being almost completely in shock. The emotions came to me on the ride home – alone – listening to the radio. And then more that night on the couch, watching the news until 2 or 3 in the morning. When I recovered from my shock that morning – it was the realization that hundreds of police, fire, and EMS personnel had gone into those buildings – risked their lives – and as we discovered later that day – many had given their lives to save others. The second is what happened to me the next morning at work. I was in the my office around 6:30am to meet someone for a long drive and spend the day visiting stores together. Shortly after I arrived at the office, I heard a loud roar overhead. “Oh, just an airplane flying by…”, I thought. Then it hit me – nothing was supposed to be flying. I ran outside and looked up. Emotionally, 9/11 affected me – like others – greatly. I was fortunate in that I did not lose any friends or family members that day. But I cried many times during the following days – sometimes out of a sense of loss – sometimes in awe of the heroism displayed that morning – sometimes just because I love my country. I would tear up just driving down the road in the weeks following 9/11 when I would see an American Flag hanging over an overpass – or when I’d hear a sound bite on the radio of Mayor Giuliani, President Bush, or others speaking about 9/11. And, to this day, the video of the Star Spangled Banner being played at Buckingham Palace in London reduces me to a blathering idiot. Two photos from that time have always stuck with me.. 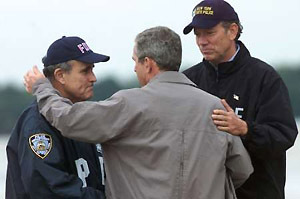 The first is the widely publicized photograph of President Bush comforting Mayor Giuliani and Governor Pataki during his visit to New York City a few days after 9/11. The second is a photo (and story) that I first saw months after 9/11 in Dennis Smith’s book Report from Ground Zero. It’s a photo of Lt. Ray Murphy of the New York City Fire Department (FDNY). 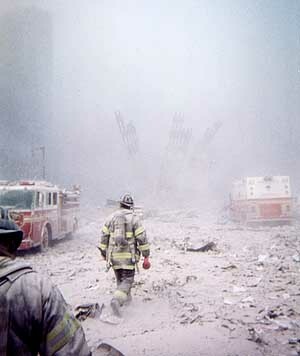 He was walking away from the cameraman following the collapse of the first WTC Tower. He had just recovered from that tower collapse and was headed into the still standing WTC tower in order to help others. Thank you Bryan, for sharing this. It's important to remember. It's important to cry. And it's important to stay focused, to stay angry. But most important is to remember.